Installment 4 of 6: This is the fourth in a bimonthly series of six articles on the growth, value and future of Design for People. The intent is to explore and discover the impact of behaviors, habits and patterns of people in the design of environments. Be sure to check out parts one, two and three of this series! People have evolved to read subtle cues in our environments. Funky art, ample light, access to nature, and museum-quality art indicate to clients that this is not your typical law firm. For the past two decades, organizations have embraced a community-oriented approach to workplace design. Conventional offices from the 1960s to the dawn of the Millennium placed a premium on the periphery of the building, while people labored their entire careers in the dark recesses of conditioned boxes for a sliver of light they could call their own. These architectural designs reinforced rigid, hierarchical cultures that were ill prepared for the pace of the future. In the 21st century, as market disruption toppled many industry titans, the demise of corporate America’s old business model was replaced with a demand for community, innovation, and speed. Today, workspaces reflect these ideals—open, unstructured, and airy, on the one hand, and dense, noisy, and distracting on the other. Open space or closed? Collaborative or private? Extroverted or Introverted? As Donnelly suggests, buildings are easy. People? Not so much. 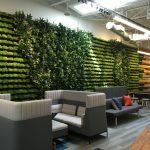 If spaces truly shape or, at a minimum, reinforce human behavior, then it should be possible to design work environments to achieve a set of predetermined outcomes. To accomplish that goal, two schools of thinking have emerged in the design and delivery of the contemporary workplace: 1) tell them what they get, or 2) let them choose what they want. Both schools have embraced leadership engagement, employee input, and the application of change management practices to ease the population as it moves from the present tense into an unpredictable future. With “tell them what they get,” the hope is to achieve alignment with the company. Design is delivered by edict where the end-users don’t participate. It is a remnant of the corporate world’s hierarchical past. The other option of “let them choose what they want” seeks engagement in pursuit of user insight and is indicative of the communal present. Here the design team embraces input but tends to resolve the problem of competing preference by creating “activity settings” in which to work. Exceptional design can emerge from both. Human neuroscience and the way people behave is a product of millions of years of evolution in natural habitats. There’s a problem though. The first school tends to be authoritarian and rigid. It gets what it expects and no more. The second is egalitarian, capricious, and susceptible to consensus rather than innovation. It seeks stasis in its own flawed way. Both schools of thought have developed in response to the problem at hand: designing places for people to work. There are those who work together and those who work solo, but the fact remains that both groups will reside under the same roof. This is the heart of the issue. Each employee comes with a set of preferences. Preferences set against a series of options determine choices. Choices made repeatedly result in a set of conditioned, predictable behaviors. Behavioral economists suggest that people have two cognitive systems for selecting a preference. The first system is highly aware and rational. It is employed when uncertainty prevails and weighing the options seems like the wisest choice. Choosing which college to attend would use this method. System number two is what one might call the well-worn road, sticking with what is comfortable and familiar. This is used to decide routine actions like what to eat for breakfast. It is this system that determines most behavior. With the rise of global commerce and mobile technology, the problem has become more complex. In the office of the past, one’s immediate surroundings dictated their environment and resulting behavior. Now, many employees interact with associates they’ll never meet. They’re also given glimpses of places they’ll never see in person. This influence by the external environment has shifted the nature of behavior insofar as it is a function of attitudes, actions, and experiences. Becoming aware of what else is out there instigates behavior that reflects this expanded awareness. In the last article many of these forces were explored, including shifts in communication patterns, labor markets, organizational structures, and delivery processes. This article turns inward and embraces people for what they are—emotional beings trying to rationalize choices that are often economically irrational. Architects and economists alike have tried their hands at predicting human behavior by using models under given sets of conditions. In the architectural sense, models are abstractions of physical conditions that assume away the imperfections and intolerances of practical consideration. The benefit of architectural models is that they allow for rapid exploration of options. The downfall is that models reduce the greatest variable—people—to immobile plastic figurines. Similarly, economic models underestimate the variability of their populations. People within economic models are set to operate in their best self-interest to maximize their own utility. If that term “utility” seems confusing, it is by design. It reduces the diversity of human preference to a generic, plastic figure. Since the brain has both passive and active modes, spaces can communicate intent using a variety of suggestions – some more literal than others. Behavioral economics takes people for what they are: human beings. Sometimes they are rational actors who consider the short- and long-term ramifications of each option available to them and then act accordingly. However, this is rare. Instead, people trust their instincts and experiences as they navigate the world. Human behaviors are often equated to being a function of people’s actions and attitudes. The reality is it’s more complicated than that. People also hold a certain set of expectations and rely on their own experiences to guide their decision-making. They do this to reduce the degree of uncertainty in their lives because it makes things easier and more predictable. Generally speaking, people like easy. Thaler and Sunstein characterize this sort of behavior by using Homer Simpson as the mascot for short-term gratification. In other words, the path of least resistance seems to become the popular choice. Also, predictability is boring and not always ideal. Instead, many constantly seek out novel experiences to augment those immediately available. Reading books, watching movies, chatting with strangers, or surfing the Internet provide experiences that expand the set of options available. In the past, novelty came at a premium. But in today’s on-demand world, it’s basically free and much easier to access. Being collectively aware of what is possible elsewhere has put pressure on what is expected from the practicalities of the workplace. In the here and now, “predictable” and “novel” undeniably are at odds with one another. As people’s behavior becomes increasingly difficult to predict, designing for behavior becomes more challenging. Office workers are more aware of the options available to them and might act differently tomorrow as a result. It throws “design by edict” right out the window. It’s the responsibility of workplace designers to narrow the options to those that will sustain individuals and organizations alike, consistently and durably. Fortunately, there’s a third option of “suggest what they might do.” Don’t tell them what they want and don’t flood them with options. Instead, nudge them in a predetermined direction. The first step to delivering on behavioral change is providing people with a wider range of options. The second step is suggesting how those options might meet different needs, and encouraging people to take advantage of them accordingly. From the evolving discipline of behavioral economic thought, a litany of terms has emerged to describe the way that well-intentioned designers, planners, policy-makers, business people, and politicians might nudge human behavior in a particular direction. Sometimes, it’s called “choice architecture.” Other times, the practice is referred to as “libertarian paternalism.” Regardless, the premise is that designers can use subtle design cues to influence human behavior in a predetermined direction. Within the context of workplace design, behavioral economics presents an alternative to the two prevailing modes of design: by decree in the first and by committee in the second. It acknowledges that people will behave in irrational ways that might be to the detriment of themselves, others, and the organization. In response, it takes people for the unpredictable human beings they are, and endeavors to limit the set of choices at hand to enable people to act in the interest of both themselves and the organization.